In File Information display mode on your Nikon D7100, the monitor displays the data shown in the following figure. Note that the illustrations here apply to still photos. Frame Number/Total Pictures: The first value here indicates the frame number of the currently displayed photo; the second tells you the total number of pictures on the memory card. Focus point: If you enable the Focus Point feature, as outlined in the preceding section, you may see the red focus-point indicator and the autofocus area brackets, depending on the focus settings you used when shooting the picture. Card slot: This value tells you which memory card slot holds the card containing the picture. Folder: Folders are named automatically by the camera unless you create custom folders. 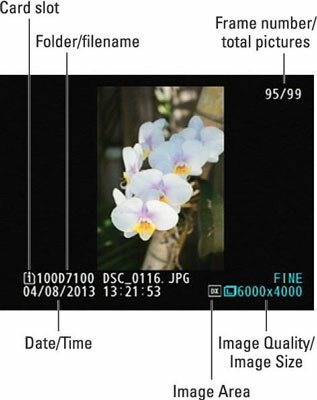 The first camera-created folder is named 100D7100. Each folder can contain up to 9,999 images; when you exceed that limit, the camera creates a new folder and assigns the next folder number. DSC_: This code means you captured the photo at the default Color Space setting, sRGB. _DSC: If you change the Color Space setting to Adobe RGB, the underscore character comes first. Each image is also assigned a four-digit file number, starting with 0001. When you reach image 9999, the file numbering restarts at 0001, and the new images go into a new folder to prevent any possibility of overwriting the existing image files. Date and Time: Just below the folder and filename info, you see the date and time that you took the picture. Of course, the accuracy of this data depends on whether you set the camera’s date and time correctly, which you do via the Setup menu. 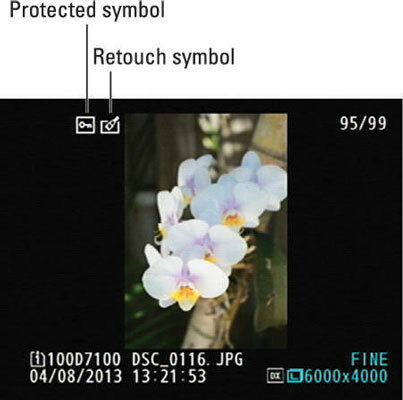 Image Area: This symbol tells you whether the DX or 1.3x crop area of the image sensor was used to record the photo. DX is the default and records the image using the entire sensor. Image Quality: Here you can see which Image Quality setting you used when taking the picture. Fine, Normal, and Basic are the three JPEG recording options, with Fine representing the highest JPEG quality. Raw refers to the Nikon Camera Raw format, NEF. Image Size: This value tells you the image resolution, or pixel count. Retouch indicator: This icon indicates an image that you created by applying Retouch menu options to the original photo.